A climate protection project in Risvangen, Aarhus Municipality, has reduced CO2 emissions and water pollution by engaging citizens from day one. to climate change ensures dry basements, better recreational areas and reduced CO2 emissions. The municipality chose Risvangen for demonstrating alternative solutions to the separation of rain and wastewater. The area’s approximately 1,000 residents were involved from the beginning, where they were invited to visit 14 selected demonstration gardens. In addition, more than half of the homeowners took up an o er to be visited by a sewer contractor. The visit enabled them to make an educated decision as to whether they would prefer to connect to water drainage or install water treatment plants in their own gardens. The project has also focused on creating added value for citizens in terms of recreational areas. The result is a patchwork of solutions where rainwater is withheld, evaporated, recycled and/or diverted to a small forest stream in Risskov, at a pace manageable. Separation of wastewater and rainwater also saves CO2 emissions, as water is no longer directed to the biological treatment plant, which requires resources for cleaning. This creates an annual reduction in CO2 emissions of 3.2 tonnes. 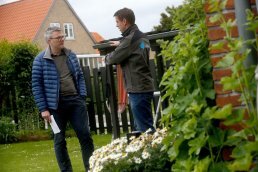 A sewer contractor from Aarhus Vand (Aarhus Water) is invited for co ee at a resident’s home to discuss how water can be handled in the garden. Citizens have been actively involved in project planning to ensure added social value. For example, a cloudburst reservoir can simultaneously serve as a football field. The project helps to adapt the city of Aarhus to future climate change through robust rainwater management solutions which have been developed at community level. Separation of the mixed and purified wastewater contributes to an 85% reduction of nitrogen and 70% reduction of phosphorus, thus protecting water-based ecosystems.